What animal has fur and can fly? It can only be … a bat! Scientists in many fields study bats for their rare “superpowers.” They are the only flying mammals, and they can “see” in the dark using echolocation (see box). Bats also help people. They keep insect populations down and pollinate plants. Unfortunately, many bats in the United States have been dying from a disease called White Nose Syndrome. Now more than ever, it is important to keep track of bats in North America. Keeping track of a group of animals is called monitoring the population. In the continental United States, bats sleep together during the day in huge groups called colonies. Scientists can carefully visit the colonies and count the bats. In Alaska, monitoring bats is more difficult. Why? Instead of sleeping in huge colonies, Alaskan bats are spread out. Their homes include tree cavities and small cracks in rocky cliffs. These mysterious homes are difficult to find. This is where people just like you come in. Bat researchers asked people to take turns as citizen scientists to help them find bats when they are active: at night. Scientists use bats’ echolocation to detect them. Bats constantly emit sounds to echolocate, but the sounds are too high-pitched for people to hear. 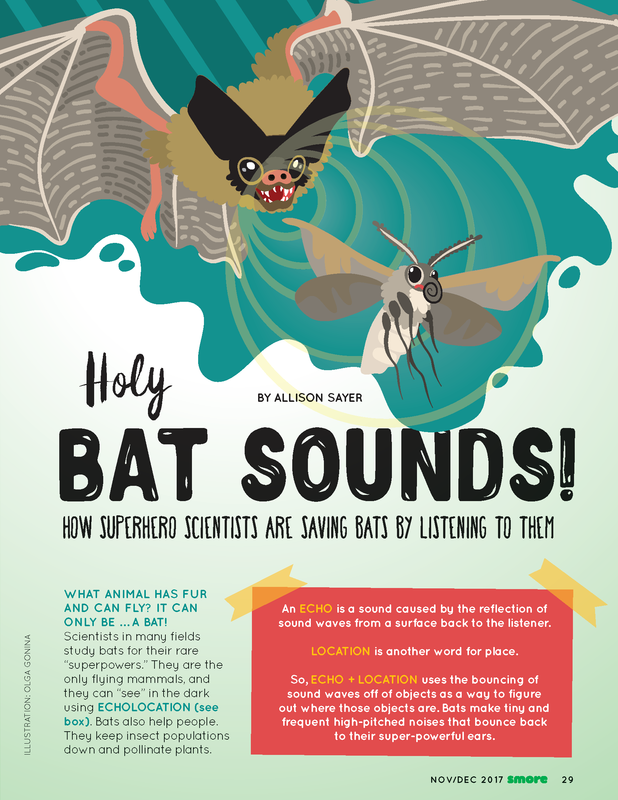 A science superhero tool called an ultrasonic microphone converts these very high frequency sounds into sounds that people can hear. With the ultrasonic microphone, citizen scientists drive along a set route and listen. They have to drive after sunset, so kids will get to stay up past their bedtime! Citizen scientists can hear clicking noises coming from real bats flying in the forest near their cars. They can also look up their survey information on the internet to see what kind of bats were detected. Different bats make different noises. The most important use for these surveys is the comparison they provide for scientists between present and future measurements. This is called a baseline. If you don’t have enough initial information, you cannot tell whether a population is going up or down. If future surveys show fewer bats than before, it is likely the population is going down. If White Nose Syndrome does reach Alaska, scientists will have a before-and-after picture to use to monitor the population. (Optional) BOX: An echo is a sound caused by the reflection of sound waves from a surface back to the listener. Location is another word for place. So, echo + location uses the bouncing of sound waves off of objects as a way to figure out where those objects are. Bats make tiny and frequent high-pitched noises that bounce back to their super powerful ears. Like the article? Article was originally published in Issue 02 (Nov/Dec 2017). Subscribe here.